The temptation to punctuate the name of this snack is too strong to resist, so here goes. Look, Chocolate! I'm going to guess that's where the name came from, because otherwise, it doesn't make much sense. Not that English brand names in Japan always make sense. Crunky, anyone? LOOK's matcha varieties haven't always impressed me, but this is Premium Matcha. 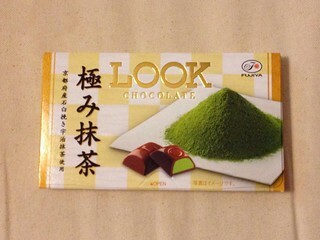 Fujiya, the manufacturer of LOOK, released several Premium Matcha snacks this spring, but this was the only one I could find online. I liked the simple, old-fashioned package design. The chocolate smelled mild, sweet, and milky. 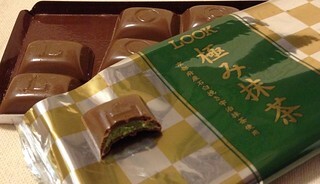 It was a soft and slightly sticky milk chocolate with a mild cocoa flavor. In the center was a slightly bitter matcha creme that was almost like a ganache. The mild chocolate was a perfect companion for the subtly bitter flavor of the smooth matcha center; stronger cocoa would have overpowered the tea. The well-balanced combination was delicate and tasty. Neither the coating nor the filling was overwhelmingly sweet. Both the chocolate and the filling melted smoothly and creamily on the tongue. Premium Matcha LOOK was simple, classic, and delicious.